I’ve eaten a vegetarian diet for 22 years now. When I first began, I was constantly traversing my way back and forth through the local health food market trying to gain knowledge of all of the unique products. The benefit of this, is that I was inspired to use new and unique ingredients, and educate myself on this alternative way of eating. This way of eating is more common socially these days, not having every parent in an uproar about where your protein is coming from. What first was intimidating is now second nature, as I adapt almost every recipe that sounds delicious, into an alternative version. 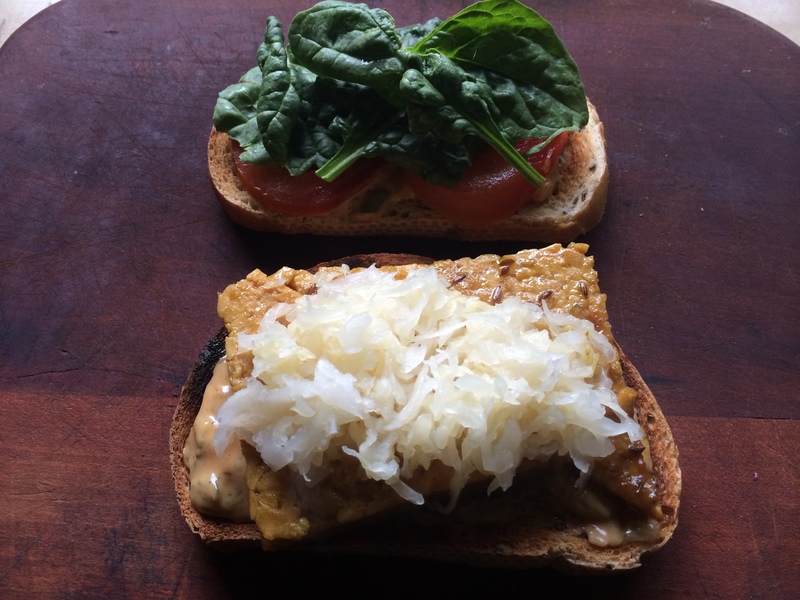 This Tempeh Reuben is an incredible way to get plenty of protein in a meal. With just one package, that serves 3, a serving contains 16 grams. I like to use the brand Light Life for it being non-gmo. I typically serve this along oven-roasted, rosemary & garlic root vegetables. I hope you enjoy it as much as my family does. It’s roaring with flavor, and is extremely satisfying. 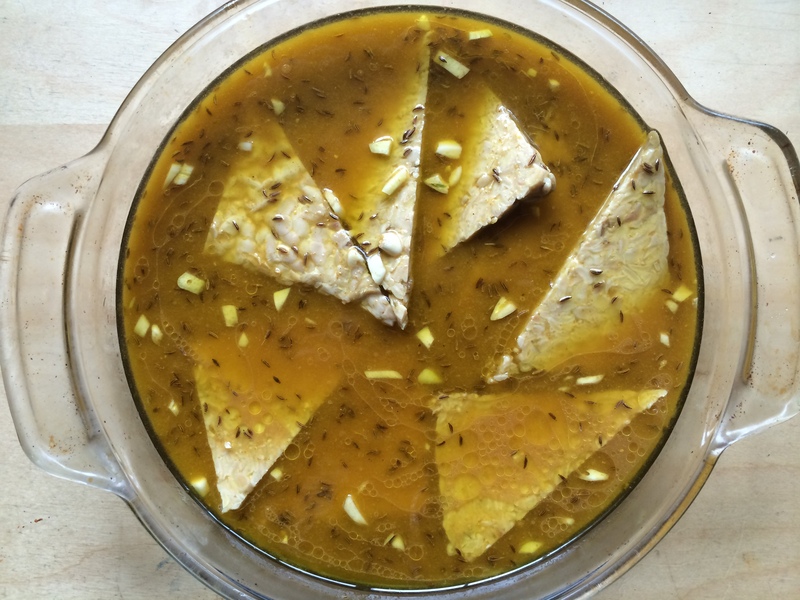 Marinade: 1 pound of tempeh (cut in half (in the middle)), then cut into triangles. Cut those squares into triangles. Split those triangles down for thinner slices. To prepare marinade: place all ingredients in a mixing bowl and whisk until thoroughly combined. Place the cut tempeh into a glass baking dish, with the marinade covering the tempeh. Bake at 350 degrees for 45 minutes. 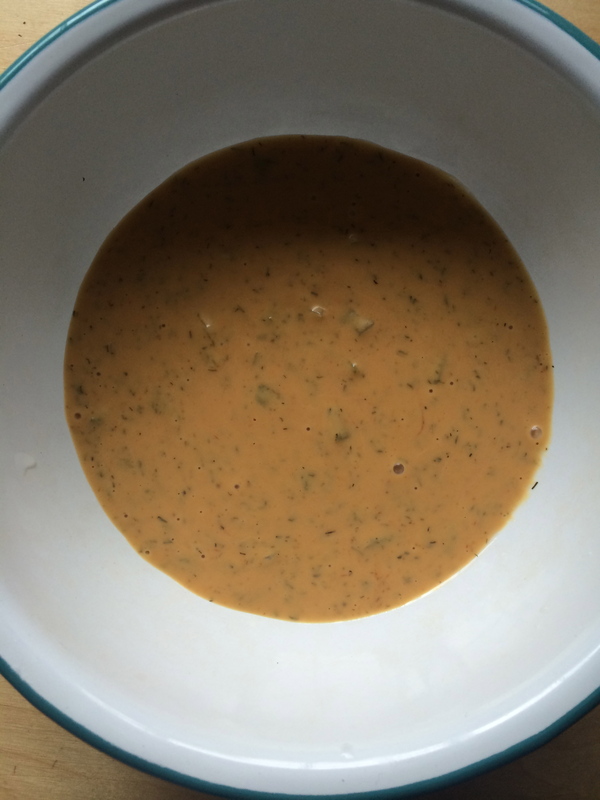 To prepare the dressing: Place all ingredients into a small mixing bowl, and whisk until well combined. To prepare sandwich: Toast 2 slices of rye bread. Take the prepared dressing and coat 1 side of each slice of bread with the dressing, layer two tomato slices onto the bread, along with spinach , 1 Tbsp. or so of sauerkraut, and two slices of tempeh. Eat while hot. Great also alongside home-made oven fries, and a sliced pickle. Thanks. I really love tempeh too. I still love your cake you prepared. It’s one of my favorites. The orange olive oil cake. Delicious. I’ll have to take a look at your cheesecake. 🙂 Everyone I have made it for, have thoroughly enjoyed it!